“I would wager that if an average citizen from Athens of 1000BC** were to appear suddenly among us, he or she would be among the brightest and most intellectually alive of our colleagues and companions, with a good memory, a broad range of ideas and a clear-sighted view of important issues,” Professor Crabtree says in a provocative paper published in the journal Trends in Genetics. While the popular press often distorts articles from scientific journals, in this case The Independent seems to have captured fairly accurately Dr. Crabtree’s point. Dr. Crabtree’s musings appeared in his recent “Our Fragile Intellect. Part I” (behind the Elsevier paywall), published in the “Science & Society” section of Trends in Genetics and later in a sequel (also behind the Elsevier paywall). Together these essays revive a genetic-materialist argument for IQ and revive the tried and true cranial-volume correlation. In addition to the hurdles these musings present in the way of testable hypotheses—Dr. Steve Jones from UCL noted “I have no idea how the idea [Dr. Crabtree’s] could be tested”—the general claims are deeply problematic. 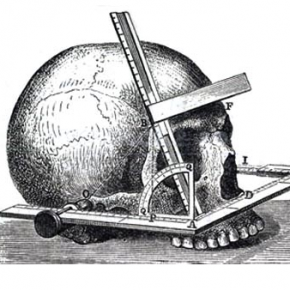 As has been shown most eloquently by Stephen Gould in The Mismeasure of Man , correlations between cranial volume or brain size and intelligence reveal more about person doing the measurement than the person being measured. Dr. Crabtree’s claims are fundamentally untestable, failing even the simplest of Popperian-falsification requirements to be a science. How would you test the intelligence or emotional function of historical peoples? … I argued that we are slowly losing emotional and intellectual traits; but how did we get them in the first place? This is one of the most important questions of modern anthropology and the subject of much investigation and debate. Although not my area of expertise, I offer the following thoughts on the topic. Surely if an author is wading into a “subject of much investigation and debate” the author has an obligation to acquire at least some expertise in that subject. And why does Trends in Genetics , an Elsevier journal, publish such musings? Elsevier has claimed that its editorial processes add something of value to the scholarly community. Elsevier claims to respect scholarly expertise and to draw on that expertise in the editorial process. It seems that the editors of Trends in Genetics did not consult anybody with expertise in “Science & Society” before accepting these essays. Trends in Genetics costs more than $2000/year for a small college. Surely for that amount Trends in Genetics can find an expert in Science and Society. **For what it’s worth, citizens in 1000BC Athens were enjoying the nadir of the Greek Dark Ages. It’s easy to imagine the Athenian agora teeming with perhaps as many as dozen goat herders vying to become this week’s alpha male.